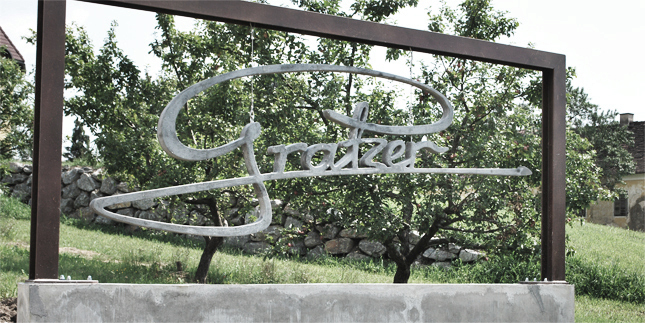 This project involved creating the “Gratzer” logo using UHPC (Ultra High Performance Concrete) according to a template belonging to Gratzer Bräu (Brewery). A test piece was manufactured following discussions on the implementation of the logo’s characters, how to fit them together and which substructure would be appropriate. Gratzer Bräu organised the transport and assembly themselves. The Gratzer Bräu logo was an ideal opportunity to find out about how to form a delicate object from concrete, which problems would arise, if any, and how to solve them. However, the experiment not only involved testing the object itself, but also the working environment. The robot design laboratory was tested to check whether all necessary work processes could be carried out. A further objective was to improve the use of extruded polystyrene as formwork for concrete casting. Therefore, during the course of this project, it is hoped to launch a test series to ascertain which release agents facilitate optimal separation of hardened concrete from the formwork.